In humans we do not have a comprehensive understanding of the cell division process, one of the most fundamental functions of life. To address this, we take a comprehensive approach to cell division at the genomic, proteomic, and cellular systems level. 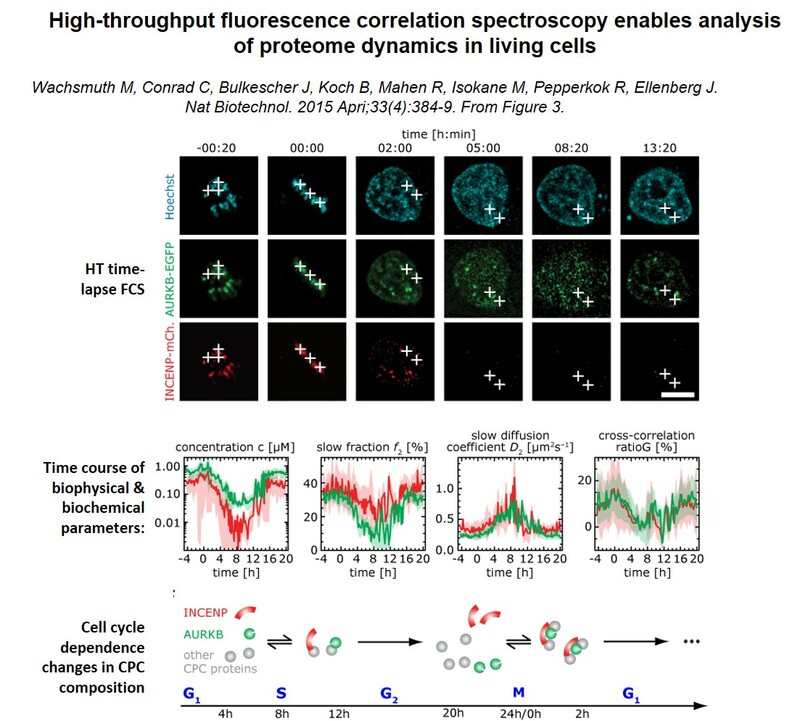 After identifying most human genes required for mitosis by high throughput microscopy (www.mitocheck.org), we have developed imaging based in vivo proteomics technology to systematically characterize the abundance, subcellular distribution, and interactions of all mitotic proteins in live dividing cells. The imaging technologies for cellular systems biology are generic and we constantly disseminate them to the scientific community by open source software, practical courses, as well as by giving open access to them in EMBL’s Advanced Light Microscopy Facility, and eventually commercializing them with industrial partners. Understanding how the genome is organized and compartmentalized inside the cell is fundamental to understand how it functions, can be duplicated and passed on to the next generation. 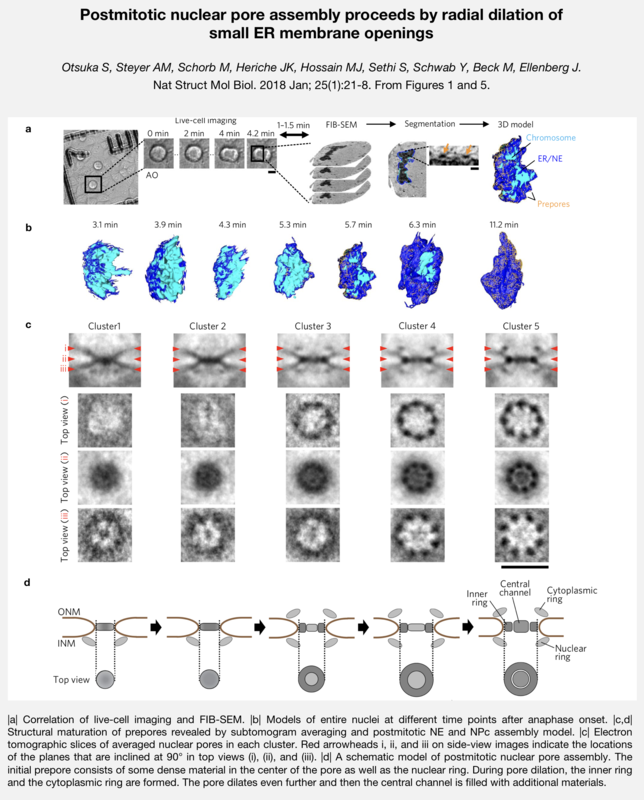 Our research on structure and biogenesis of the nucleus currently focusses on the biophysical characterization of the native structure and dynamics of chromosomes, the structure and assembly of the nuclear pore complexes, and the targeting mechanism of membrane proteins to the nuclear envelope. These studies are carried out in cultured mammalian cell lines and also serve to develop new imaging technologies with higher resolution and more direct mechanistic insight into protein function. 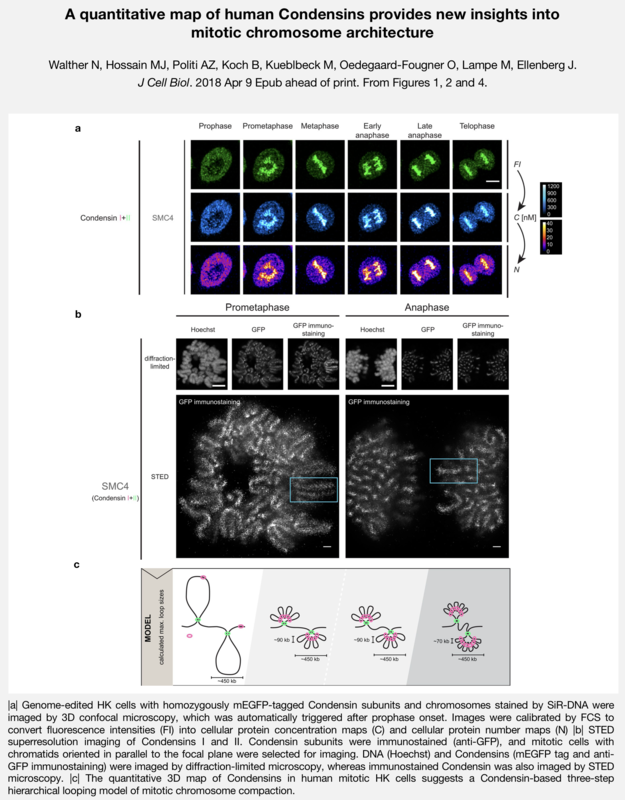 Traces chromatin organization in mammalian nuclei with super-resolution microscopy. 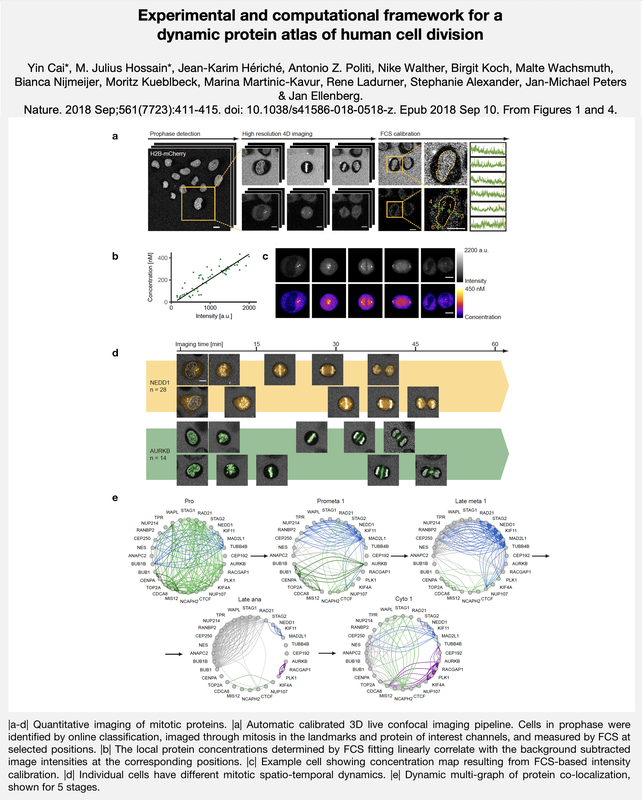 Seeks to unravel the structure and dynamics of interphase NPC biogenesis by integrating live cell imaging with super-resolution microscopy. Chases epigenetic marks along the path of DNA with super-resolution microscopy. Aims at revealing the assembly process of the nuclear pore complex by using correlative live cell imaging and electron microscopy. Inspects the 3D path of DNA through whole chromosomes with super-resolution microscopy. Investigates the molecular mechanism of NPC assembly with high-resolution fluorescence, single-molecule and correlative techniques. Unravels chromosome condensation by live-condensation assays and super-resolution microscopy. In humans and mammals in general the formation of an egg from an oocyte and the preimplantation development of the embryo occur by subsequent meiotic and early embryonic mitotic divisions, which are very poorly understood, especially because they normally take place deep inside the body. A better understanding of this process is of fundamental importance since errors in oocyte meiosis and early embryonic mitosis are leading causes of infertility and congenital disease in humans that increase with age. We have therefore established mouse oocytes and early embryos as a model system to apply our high-resolution and high-throughput imaging technologies and combine them with rapid loss of function experiments to investigate the molecular mechanism of these crucial cell divisions and understand why they are so error-prone. To be able to observe these very light-sensitive first stages of mammalian life, we are developing new, more light efficient imaging technologies that allow higher resolution analysis at low illumination energy. Studies the spindle assembly checkpoint (SAC) in the preimplantation mouse embryo. Develops the next generation of light-sheet microscopes for imaging of preimplantation development. Studies cell division and the generation of aneuploidy in the early stages of embryo develoment. Studies spindle assembly and architecture in the early mouse embryo. The US Common Fund’s 4D Nucleome program aims to understand the principles underlying nuclear organization in space and time, the role nuclear organization plays in gene expression and cellular function, and how changes in nuclear organization affect normal development as well as various diseases. This program will develop technologies, resources and data to enable the study of the 4D Nucleome, including novel tools to explore the dynamic nuclear architecture and its role in gene expression programs, models to examine the relationship between nuclear organization and function in both normal development and disease, and reference maps of nuclear architecture in a variety of cells and tissues. Jan Ellenberg was awarded with an Advanced Grant by the European Research Council (ERC). The ERC promotes frontier research by outstanding scientists and selects projects based solely on scientific excellence. In COREMA we study cell division and the origin of embryonic aneuploidy in preimplantation mouse development. Cell division is fundamental for development. In the early mammalian embryo it drives the rapid proliferation of totipotent cells, the basis for forming the fetus. Given its crucial importance, it is surprising that cell division is particularly error-prone at the beginning of mammalian life, resulting in spontaneous abortion or severe developmental retardation, the incidence of which is increasing with age of the mother. Why aneuploidy is so prevalent and how early embryonic development nevertheless achieves robustness is largely unknown. The goal of this project is a comprehensive analysis of cell divisions in the mouse preimplantation embryo to determine the molecular mechanisms underlying aneuploidy and its effects on normal development. Recent technological breakthroughs, including light sheet microscopy and rapid loss-of-function approaches in the mouse embryo will allow us for the first time to tackle the molecular mechanisms of aneuploidy generation and establish the preimplantation mouse embryo as a standard cell biological model system. For that purpose we will develop next generation light sheet microscopy to enable automated chromosome tracking in the whole embryo. Mapping of cell division errors will reveal when, where, and how aneuploidy occurs, what the fate of aneuploid cells is in the embryo, and how this changes with maternal age. We will then perform high resolution functional imaging assays to identify the mitotic pathways responsible for aneuploidy and understand why they do not fully function in early development. 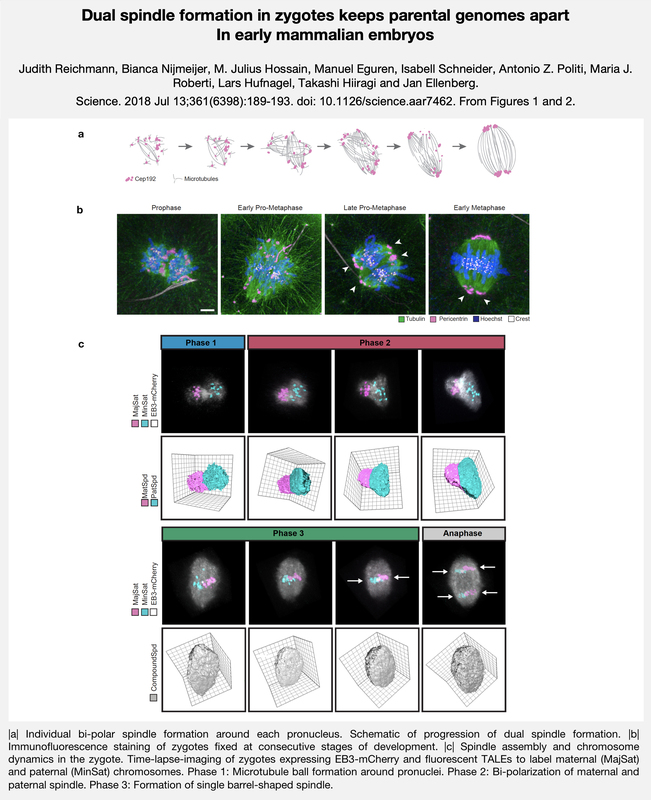 Key proteins will be functionally characterised in detail integrating light sheet imaging with single molecule biophysics in embryos from young and aged females to achieve a mechanistic understanding of the unique aspects of cell division underlying embryonic aneuploidy. The achieved knowledge gain will have an important impact for our understanding of mammalian, including human infertility. In addition to his research activities, Jan Ellenberg is currently leading the implementation of Euro-BioImaging (EuBI) for EMBL, and in this regard he has scientifically coordinated this pan-European ESFRI research infrastructure project for biological imaging technologies during its submission to the ESFRI roadmap and the Preparatory Phase-I (2007-2014). Currently, he coordinates Euro-BioImaging Preparatory Phase II (2016-2017) and is the Scientific Coordinator for Global BioImaging (2015-2018). He represents EMBL in the Euro-BioImaging Interim Board together with Iain Mattaj (EMBL Director General) and Rainer Pepperkok (EMBL Head of Core Facilities). Jan is also the local coordinator of the EC funded “Combined Collaborative Project & Coordination & Support Action” for construction of new infrastructures “BioMedBridges” (2011-2015) and “CORBEL” (2015-2019), in which he coordinates the participation of Euro-BioImaging partners for biological imaging. 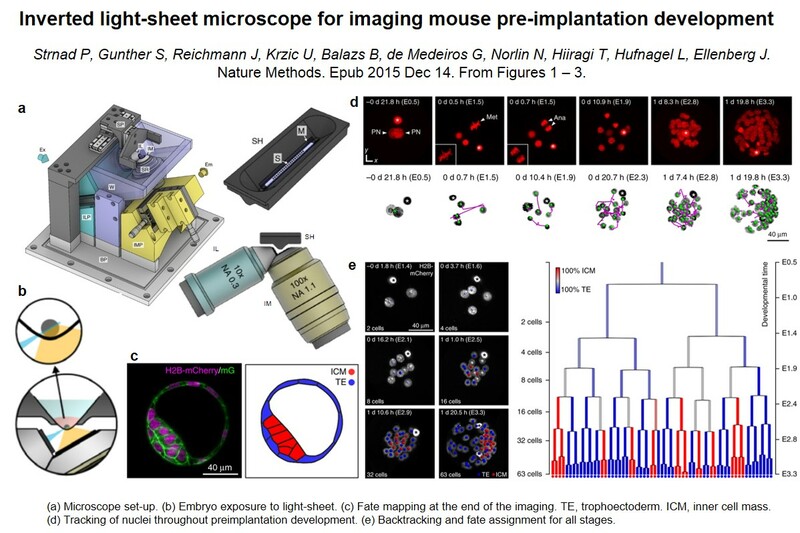 In these tasks, he is supported by the team for Imaging Infrastructure Strategy Development (IISD) which is part of the Cell Biology and Biophysics Unit at EMBL Heidelberg. It supports EMBL in its strategy development for and participation in national and European research infrastructures in the field of imaging technologies. EuBI will act as the European research infrastructure in the field of biomedical imaging. The innovation-driven nature of EuBI facilities will strengthen Europe’s leading role in developing and implementing cutting-edge imaging technologies. EC H2020 funds for the Preparatory Phase II: In the scope of a EC call for scientific infrastructure development, EuBI was granted € 1.5 Mill for its Preparatory Phase-II (PP II), to take the final steps needed to start full operation for open user access by 2017. In the next 2 years, the legal documents and contracts that will establish EuBI as a new European Research Infrastructure Consortium (EuBI ERIC) will be finalized and signed by its European member countries and international organizations such as EMBL. By joining the EuBI ERIC, its members put EuBI commonly on the infrastructure map of Europe and open its doors for access and services in imaging technologies to all researchers. The countries are now establishing the first generation of EuBI Nodes to be ready for operation. In this regard, the PP II grant also provides the means to prepare the procedures for including additional Nodes in the future and to identify exciting novel imaging technologies that were developed just recently and may be suitable for open user access as part of EuBI. In PP II, the comprehensive EuBI training program for researchers of all levels, as well as the advanced training for core facility staff will be put in place, and the training sites will be prepared for running first courses upon start of the EuBI ERIC. In parallel, the EuBI partners can now develop and test the concepts for future EuBI Image Data Repositories, which will host and offer access to large-scale, high-quality image data sets of common interest for the scientific community. Gradually taking over tasks from the EuBI Interim Phase working groups and support staff, the future EuBI Hub will be put in place in the next 18-24 months, then coordinating all activities at the European level of the EuBI ERIC. In summary, the EC H2020 grant paves the way for EuBI to go full speed into operation in 2017.